It would appear that Paper Island is actually the site of an old paper warehouse which was vacated by the printing industry in 2013. 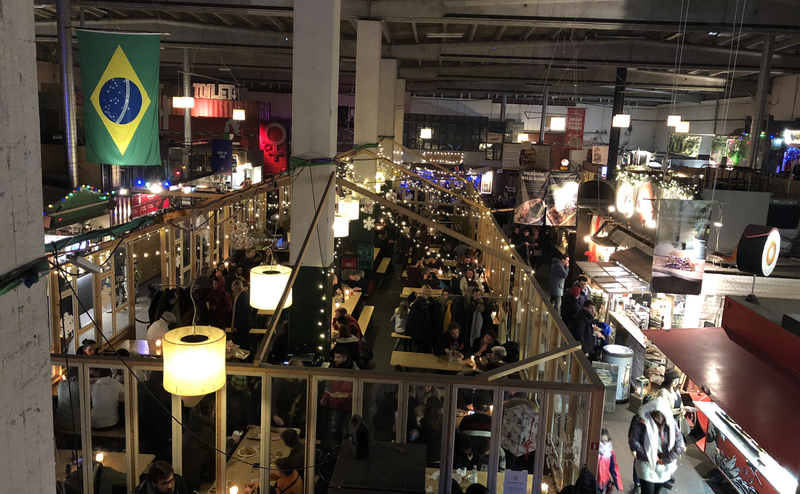 Next year they are going to clear the site and build some Scandi style apartments, but at the moment, the site is home to a rag tag collection of food trucks in the empty 1960’s warehouse. Street food is hugely popular at the moment, and I do like street food. Well I like food, I’m less keen on the street side of things. I always love the idea of buying food from a truck; it’s just the process of eating it that I find difficult. If the meal has any removable/loose bits (and let’s be honest, hopefully it has), then I will drop it; if it has a sauce then I will end up with most of down my sleeve. If I then have a drink as well, forget it, I just haven’t got enough hands. This place however was equipped with tables galore, beer Keller style, so you could actually sit down and enjoy your purchases (and at the prices the charge here, I actually thought I had bought the table in my meal price). We headed down to the docks only stopping at a few Christmas markets en route. Needless to say, we arrived bang on lunch time (if the Danes eat lunch at 3pm). The first surprise (other than the number of people eating in the middle of the afternoon) was that the place still appeared to be a working dock and we dodged forklift trucks, storage containers and HGV,’s to get to the place. Once inside, it was an Aladdin’s cave of food (if Aladdin was a very versatile chef). Indian, Chinese, Korean, Japanese, Brazilian, you name it, it was there. Except Danish. Distinct lack of rollmop, but you can’t have everything. We eventually settled on Chinese. There was one bloke taking orders, making the meals and serving us. And he could still knock out a Teriyaki chicken from scratch quicker than a barista in Costa can make a latte. The place was heaving, so we decided to divide and conquer and Karen went to find a seat with the food and I got the drinks (well someone needs to buy those £6.00 beers). When I found her, she had managed to tag on the end of a table for 6, but I noticed that there was a reserved sign on the table. It was only 3:20, so we had plenty of time to eat our plates of food. The only thing that is faster than the food is the turnover at the tables and within 10 minutes everyone who was present when the news of the reservation was made had now gone, leaving Karen and I with a table to ourselves. It was a bit embarrassing as people were desperate for seats; but because they saw a reserved sign, they steered clear of our table. Being a philanthropic chap, I decided to invite people onto “our table”. If they looked longingly at the empty spaces on the bench, I would smile and gesture to places in a “please come and join us” manner. Still unsure, people seemed to eat doubly quickly so we rattled through a succession of dining guests. What none of them realised was they were actually playing a dangerous game of pass the parcel and that if they were still there at 4:00 when the music stopped,then they would have a very nasty forfeit and be ejected from the table. Luckily, we were well clear by then so we had no idea what happened. We still had a dozen more Christmas markets to visit before sundown.